Because the moon’s orbit around the earth is not an exact circle (it’s nearly circular but not quite), there are key times in the year when the moon is either closer to the earth than other times (perigee) or further away (apogee). At the closest times, supermoons are possible and there are usually four to six supermoons a year. The moon looks bigger at supermoons (when visible at a Full Moon) and causes bigger tides. The bigger tides happen even at non-visible new moon supermoons. Can New Moons Be Supermoons? Astrologer Richard Nolle coined the term ‘Supermoon’ and he includes closest New Moons too. But not everyone agrees about including new moons. I include new moons because the effects feel very ‘supermoon’. 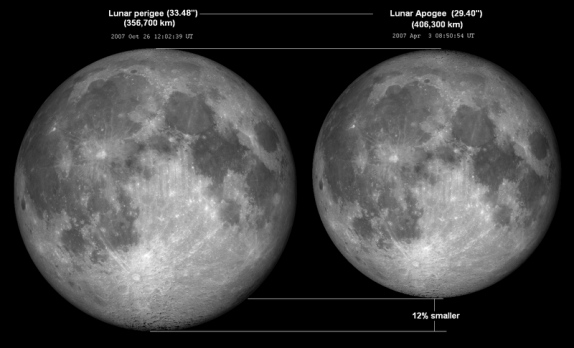 Even a lot of astronomers now use the word ‘supermoon’ to describe perigee moons, whether full or new. What Are Some Supermoon Effects? Our ‘Moon’ natures, i.e. our emotional, intuitive sides, are increased at Supermoons. With everyone’s inner energies amplified, and energy fields more ‘electric’ everything from irrational outbursts to heightened creativity, spiritual bliss or romance is possible. ‘Soul information’ can be stronger and we can feel a magnetic pull toward our greatest longings. Yet it’s up to us to discern what is wishful thinking/illusion from a genuine soul need; generally it helps to allow a few days for things to settle after a supermoon before making lasting decisions.